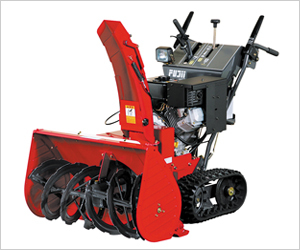 Fujii employs large-diameter single-stage augers for all its snowblowers for their high biting performance. The augers are supported at both ends for all the models and excel in destructive power. *The shooter can be easily adjusted by moving an electric lever. *Operation speed can be controlled steplessly with the HST lever. Smooth switching between forward and backward movement. *The auger part can be moved up and down effortlessly with a power-assist lever.